This contest is geared towards students in 5th through 8th grades to promote patriotism among young people. 1.Eligible participants must be Students enrolled in the 5th, 6th, 7th or 8th grade at the time of the contest. 2.Essay length is not to exceed 250 words. 3.Essay must be typed or legibly printed in ink. Also, Essay must be submitted as written (or typed) by the entrant. 4.Essay must be submitted for judging to the Elks Lodge nearest to the address of the entrant. 5.Participant must be identified by name, grade, school attending and sponsoring Elks Lodge on the Essay. 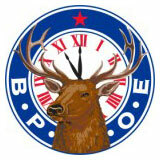 All applications must include the cover page to identify the student and local Elks Lodge it is submitted to. Essay should be submitted to your nearest local Elks Lodge.